Ultimate Haswell. Equipped with some of the fastest mobile Haswell and Kepler chipsets currently available, the Eurocom X3 shows no mercy when it comes to application and gaming performance. We take a closer look at the hardware and its performance advantages over the previous Intel and Nvidia generations. 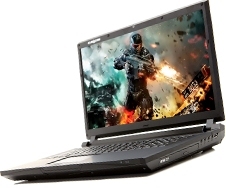 With a potent Intel quad-core processor and Nvidia's new GeForce GTX 880M graphics card, the Eurocom X3 has the gaming chops to satisfy even competitive gamers. The blend of features and performance is pretty good, though many gaming laptops are still missing key features for a truly intuitive Windows 8 experience, despite shipping with Windows 8.1 Pro. The glaringly bright display skews colors, but it can be toned down in the display settings. The lack of a touch screen is also acceptable, but the lack of proper gesture support can be problematic. All in all, the Eurocom X3 is a very good gaming laptop, but it's missing a few refinements that could make it great, and the Editors' Choice goes to the similarly equipped, but more affordable, MSI GT70 2PC Dominator. The Eurocom X3 prioritizes performance above all else, a quality that is certainly admirable in a gaming oriented device. With its Haswell processor, lightning fast SSD, 16GB of Ram and NVidia Kepler GPU the Eurocom X3 delivers on all fronts. Sure it's nice to have the latest and greatest technical specs, but users can easily cut out some of the fluff or tone down a few of the specs to create a far more cost friendly machine. There's a great deal here hidden in the Eurocom X3, but users are going to have to dig-in and find it for themselves. NVIDIA GeForce GTX 780M: Видеокарта класса high-end серии GeForce 700M, основанная на архитектуре Kepler. Эти видеоадаптеры справляются с большинством современных игр и демонстрируют в них более или менее комфортную частоту смены кадров. Однако особенно требовательные детища игровой индустрии придется на них запускать со средней или низкой детализацией. Плюсом таких видеокарт является то, что их можно использовать в не очень больших ноутбуках с приличным временем автономной работы. 4930MX: Процессор с 4 ядрами поколения Haswell.